Even if you are not a coin collector and have no interest in them, Heritage is currently auctioning one of the most incredibly rare and historic coins I have ever seen, in their August 14-19 Platinum Coin Sale, Lot #5010. There is so much documentation on this coin that it would take you the better part of an hour just to read Heritage's description. The coin was the centerpiece of the Eric P. Newman collection, who died last year at the age of 106. He's owned the coin since 1942, and it last appeared in auction in 1890. If you love great historical items it's certainly worth a look, and if somebody could post a picture of the front and back I would appreciate it, since I don't know how. Thank you. Last edited by barrysloate; 07-26-2018 at 11:51 AM. Quite a piece. Fifty four pages, including bibliography, of information about the coin. I personally, would like the Confederate half dollar. I have seen several of the genuine Confederate coins available over the years, but could never afford them. I stuck with currency and some stamps, all now long gone. Most of the remaining Confederate half dollars are restrikes. I believe there are only four originals, and Newman had one of them. And thanks for the link. What auction houses were around in 1890? Coin auctions started to appear as early as the 1850's, and were prevalent in the late 1800's. Usually it was a single proprietor or family who ran them. Among the famous late 19th century numismatic auctioneers were the Chapman brothers. Coin collecting is a very old hobby (and could probably use an extra shot of oxygen today). Last edited by barrysloate; 07-26-2018 at 02:33 PM. There are the 12 or so original Confederate pennies along with the 1861 New Orleans coins which fall within the category. The M.F. Beirn Magnolia Hotel Civil War token uses the same obverse die used in the Confederate penny. The engraver, Robert Lovell lived in Philadelphia when he was contacted by the C.S. government to produce the penny which he later used for the token. The token has been nicknamed the 'Poor man's Confederate cent'. Last edited by Michael B; 07-26-2018 at 04:25 PM. This coin was presented by the engraver to George Washington as a prototype for the first gold coin ever to be minted in America. Washington of course rejected it, as he did not believe a living president of a democratic nation should have his portrait on a coin. He liked it well enough, however, to carry it around as a pocket piece. Even though it exhibits wear it never circulated, it just jiggled in his pocket over a period of time. When Washington died in 1799, he was no longer in possession of it. He must have given it to somebody else, but nobody knows to whom. The coin has been exhaustively researched by numerous scholars, and has been in Newman's collection for the past 75 years (he collected coins for 99 years). I don't have any idea what it will sell for, but I am guessing $3 million, maybe more. And thanks Bob for the photos. Last edited by barrysloate; 07-26-2018 at 06:48 PM. So does that make it among the most expensive coins to have sold? I think there are probably more than 10 coins (may be many more) that have sold for more than that. Barry might know more, mine is a guess based on watching coins sometimes. It was only the second highest price in that auction. An 1854-S $5 gold piece sold for $2 million plus. However, coins that sell for the most money are those issued for circulation that for any number of reasons become exceedingly rare. 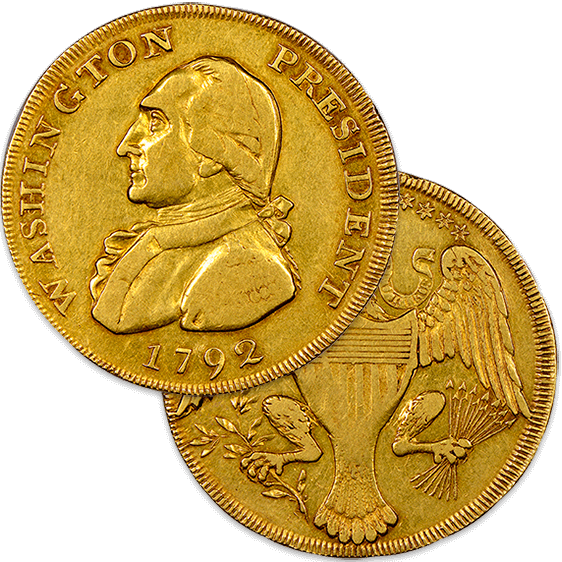 In the case of the Washington gold piece, it was only a pattern, and never issued for circulation. And I believe it is a record, or close to one, for a coin that was a pattern only. Leon is correct there are quite a number of coins that have sold for more, probably a few dozen at least. A 1933 $20 double eagle is still the record holder at $7.6 million (I think). That was sold in 2002 and that record has stood for 16 years. Last edited by barrysloate; 08-19-2018 at 06:44 PM. I stand corrected. A gem uncirculated 1794 silver dollar sold for over $10 million. The 1933 double eagle is number #2. Man i not read the history of the 106 owner, but for many of us, after at least 90 years or so, we probably have to pay for full time help....hes just holding onto the coin...must be nice.. Thanks for those links Irv. I always thought the 1933 was unique in private hands. But now a family owns 10 of them. I don't think that will help the value of the one sold for $7.6 million. Wonder of others will make it to the auction block. Damn those are beautiful coins. The lawsuit where the government lost the appeal was decided years ago but can't find any recent information on the fate of the 10 coins. Last edited by Peter_Spaeth; 08-19-2018 at 10:57 PM. It turns out the government ultimately won the case. The family doesn't own any, the courts found they were stolen. The coins presumably are back in Fort Knox. And 2 others are in a museum in D.C.
Last edited by Peter_Spaeth; 08-20-2018 at 05:57 AM. There is a long history of well connected collectors befriending mint employees and getting them to steal, or in some cases even fabricate, rare coins for them. The 1913 Liberty Head nickel, of which five are known, has an interesting story. Oh my God, Barry. PSA will now have to add another qualifier for pocket jiggles on gem mint cards. How the PJ qualifier will affect market value is uncertain. It's actually been graded a XF 45 by NGC, with no jiggle qualifiers. Even the replicas of that coin look pretty good to me. The Wikipedia article is very interesting, some incredible history and some fortuitous timing. One of the things that advanced coin collectors are very interested in is the provenance of a coin, and this Washington Eagle has an illustrious one. We recently had a thread in the baseball card section about this very topic, and most who posted said they could care less if the previous owner's name was on the label. I think the objection was that no one wanted to pay more for a card because it was in some famous guy's collection. But provenance isn't about paying more, it's about tracing the history of an object and getting as much information as you can about it. In that respect coin collecting is a bit ahead of the baseball card hobby. Perhaps as card collecting matures, provenance will take on greater importance. The slab cleanses any and all concern about provenance. It may be more relevant for memorabilia and autographs where authenticators IMO are easily fooled. The slab is pretty important in the coin hobby too. Some collectors study die varieties and learn about the coin's history, while others are in it to buy gem examples and resubmit them as many times as it takes to get a higher grade. So both hobbies kind of mirror each other. I agree the slab crowd couldn't care less about provenance, but those who want to learn find it important. Last edited by barrysloate; 08-21-2018 at 09:33 AM. Last edited by RedsFan1941; 08-21-2018 at 08:50 AM. Lest we not overlook collectibles signed by their owners, who don't give a flip. I could certainly waddell jnto this discussion, but i shant. You're too much of a rube to be discussing expensive coins. You're right. I wouldn't touch your ducats with a ten foot pole. They are symmetrical unlike your gonads. Never thought I would see the terms "1792 Washington Eagle" and "gonads" in the same thread. Wasn't the Moody Blues first hit song called "Gonads?" Inside joke, from Frank's post on another thread about centering. And yes, that hit preceded Knights in White Satin and Hide My See-Saw. Last edited by Peter_Spaeth; 08-22-2018 at 06:37 AM. You know Peter, the other day I lost my ball of string, so I was In Search of the Lost Cord. Balls of string can be Hayward. I hope you found it Justin time. Or did it Lodge someplace? Last edited by Peter_Spaeth; 08-22-2018 at 07:10 AM. Now that was impressive! Although I think it might make Timothy leery. Volleys like this belong in the Tennis Section of the Forum. Right, Leon??? That is the story in your eyes! !